Wash dal and pressure cook it in 4 cups of water for 3 whilstles. Add salt while boiling. Take a pan and heat ghee. Add cloves, bayleaves, cumin seeds, green chillies, asafoetida and saute it for 2-3 times. Add garlic and onions and saute it for 3-4 minutes. Add tomatoes, turmeric powder, red chilly powder, coriander powder, garam masala and cook for about 2 minutes, stirring occasionally. Add dal, salt and mix it well. Add coriander and mix it. Take a bowl and add all the flours. Add salt, fennel seeds, carrom seeds, ghee and mix it to knead the stiff dough. Add milk as per the requirement. Make small balls and shape it to round. Flatter the rounds, make a small indentation in the center with your thumb. Take a pan and boil water. Put all the baatis in the boiling water and cook on a high flame for about 15 minutes. Turn them occasionally. Drain it in the colander and let it cool completely. Take a pan and heat ghee. Deep fry all the baatis in batches till it turns light brown. Drain it on the absorbent paper. Warm the dal. Take 2-3 baatis, break them into small pieces and put it in a dish. Pour about 1 teaspoon melted ghee on it. Pour dal over it. Sprinkle onions, lemon juice and serve it immediately. 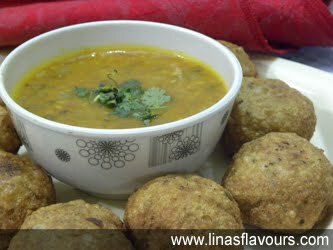 Note: Dal Baati is generally served with churmu.